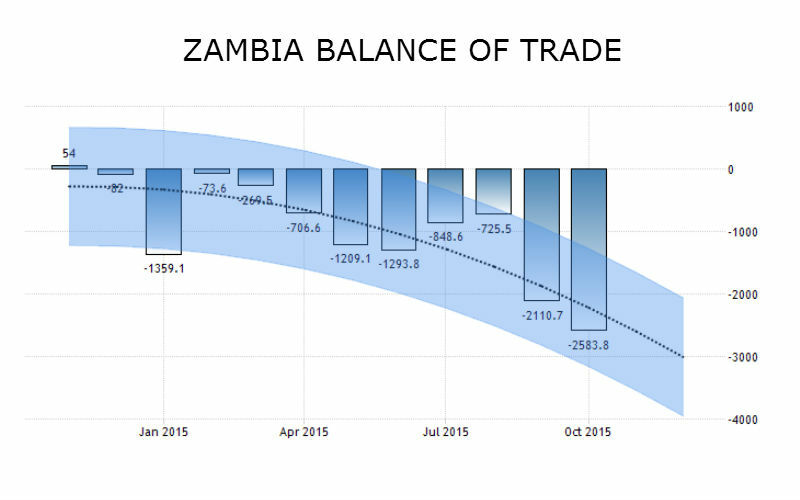 The Zambian Central Statistical Office (CSO) has recently announced that the country’s trade deficit has improved by 52.57% from ZMW 2,585.3 million in October, 2015, to ZMW 1,226.1 million recorded in November, 2015. It was the result of a growth in total exports of 31,41% from ZMW 6,191.1 million in October, 2015, to ZMW 8,135.8 million in November, 2015, while imports merely recorded an increase of 6.67% from ZMW 8,776.4 million to ZMW 9,361.9 million in the same period. The rise in exports was mainly driven by intermediate goods as copper cathodes and selections of refined copper that accounted for 80% of total exports in November, 2015, while consumer goods, raw materials and capital goods accounted for the balance. There has been an important increase of 36.6% in the total value of copper exports from ZMW 4.39 billion in October, 2015, to ZMW 6 billion that has been followed by an increase on non-traditional exports (NTEs) from ZMW 1.8 billion to ZMW 2.1 billion in the same period, explained CSO Director of Census and Statistics John Kalumbi. The NTEs were driven by the export of precious and semi-precious stones that recorded a total value of ZMW 171.6 million in November, 2015, which accounted for 8.1% of total NTEs exported and ranked second in its group behind maize representing 10.5% of the group in the same period. Regarding the country’s major export destinations for both metals and NTEs, Switzerland remains at the top since it accounted for 43.8% of the total export earnings in November, 2015, while China kept the second position accounting for 11.6% of the total in the same period. According to the CSO, Switzerland is extending its gap with China as the top destination since it accounted for 44.7% in November, 2014, up from 39.1% in November, 2013, while China has seen its share dropping from 17.6% and 27.0% in the same periods.